I traveled with 18 other adventurous souls, including one of my favorite trip leaders, Anne Gordon de Barrigón. We piled into three small boats for seven whale watching trips over three days in early February, 2017. Higher winds than usual caused rough waters for the first day. After breakfast, I popped a Bonine motion sickness pill in my mouth and silently prayed that I wouldn’t throw up in the boat. I forgot about my nervous stomach when I spotted the first gray whale to introduce itself to our boat. 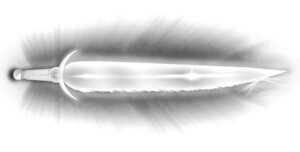 It surfaced, spewed a fine mist from its blowhole, inhaled, and repeated a few times before diving into the deep Lagoon. I could have spent hours watching the serene simplicity of this ocean mammal breathe. Just, breathe. The waves must have aligned for a day of excitement and curiosity, because several gray whales continuously spyhopped around our boats. For this activity, whales jump vertically out of the water until their eyes break the surface. It resembles periscope up from a submarine, but more like the front of the submarine emerging from the waters. 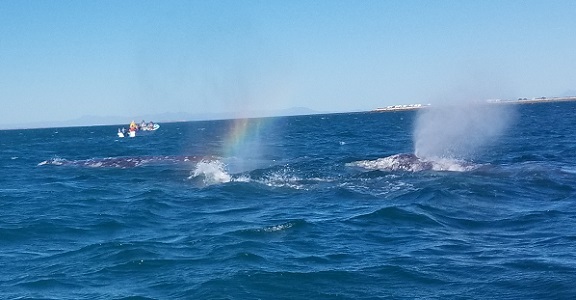 Our trip leaders said the whales do this to warm themselves on sunny days, as well as look at their surroundings. We cheered and clapped each spyhop, then called to the whales for more. One whale spyhopped just a few feet from our boat, allowing me to look into its eyes. I felt a welcoming vibration from this enormous creature, as though it acknowledged my long journey from Atlanta, Georgia, to admire it. In the afternoon of the first day, a juvenile gray whale swam beside our boat three times, allowing everyone in our boat to touch it! For my first contact with this whale, I stroked its face like rubbing the back of my cat. The whale’s firm, slick body reminded me of the inner tubes we used back home for floating down a river. Plus patches of barnacles. The six-second thrill of connecting with a wild animal in its natural habitat on its terms will last in my heart for a lifetime. The next time this whale came close to our boat, I put both my forearms on it for a hug. Barnacles slipped under my palms, but I didn’t mind. I stretched as close to the whale as possible for every inch of touch. I yelled goodbye to the whale as it departed, my heart overflowing with joy. Reaching my goal of touching a gray whale wasn’t as significant as the gift it gave me of unconditional trust. While sitting in the front of the boat with two other ladies, we unexpectedly rose in the air about three feet. I grabbed the edge of the seat, worried that I might fall overboard. As quickly as we went up, the front of the boat plopped back down in the water. A whale had swam beside our boat, under it, and then “bumped” it, perhaps intentionally, to play. Must admit, I liked the game. The tone of the second day shifted from rambunctious playground to doting nursery. We mostly observed pairs of gray whale mothers swimming with their young calves. Born just a few weeks ago, the calves swam close to their mothers and surfaced more frequently for vital breaths of air. They often rested on top of their mothers’ faces or backs. When the mother surfaced, her calf rolled into the water. When it was time for Mom to dive, the calf climbed on top of her again. A mother-and-calf pair circled close to our boat during the morning trip. Anne Gordon de Barrigón said that this was atypical behavior for the mother of such a young calf; usually they were more protective. The calf didn’t seem disturbed by the boat or our oohing and aahing. I felt honored to watch this maternal interaction with such trust and close proximity. The experience reminded me of my sister letting me hold her first born for the first time. 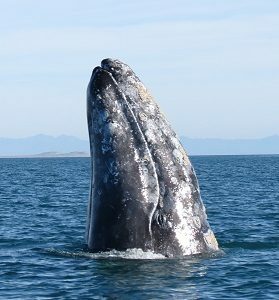 If I journey to the San Ignacio Lagoon for another trip to watch the gray whales, perhaps the calves I saw this year will be swimming beside my boat for a trusting touch or jumping into the warm air for eye-to-eye contact. Whale worth a bucket list repeat. Excellent report Jean. Very whale written. Loved reading your account and feelings from our trip with the Gray whales together. Big whale hugs my friend!